Bare landscape, harsh looking environment, windswept and sparse. Here follow some ideas about the meaning of The Page of Swords Tarot Card. I was given a deeper insight into this card whilst involved in a short lived virtual relationship recently. 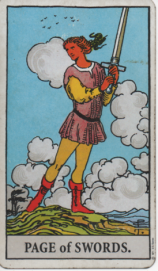 When I asked the cards questions about the relationship and its potential The Page of Swords Card appeared in nearly all of the readings symbolizing to the man in question. I wondered about this at the time….. He and I conversed by email and got on very well using that medium, we then started talking by phone and again we got on brilliantly and yet there was a slightly harsh edge to his voice which made me wonder about him. He was also quite a lot younger than me, which would account for the Page part of the symbolism. Also highly intelligent, which would account for the Swords part…. We were at the stage when we were about to meet up in person and I was getting quite excited about the whole thing. Then……..I was doing a very complex and involved Tarot Reading which literally took me 7 hours to complete. In the middle of this intense period of concentration, he phoned me and I said I would phone him back when I had finished…….several hours later I returned his call. Only to be met with a less than enthusiastic response. I could understand why he would be pissed off and I apologized profusely and explained my situation but never heard a thing from him again. So, through working with the cards and at the same time having an intense interpersonal experience I felt that I gained a very real sense of the Page of Swords energy. Thank you dear Page of Swords. Really, I will be more thoughtful, considerate and careful next time! If you would like to order an Intuitive Email Tarot Reading from me please click here.